There are some critics out there that haven&apos;t been too kind to the Impala&apos;s current W-body. Although the frustration is understandable, Chevrolet&apos;s biggest retail sedan was also scheduled to get a complete makeover in 2013. 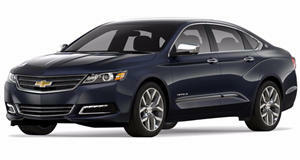 But recent reports only disappoint further, especially since some GM sources revealed that the next Impala has now been rescheduled for the 2014 model year. So in order to keep the current Impala going until its new Epsilon-based replacement arrives, GM is reportedly ready to equip it with the company&apos;s 3.6-liter V6 engine mated to a six-speed automatic transmission. Both of GM&apos;s current 3.5- and 3.9-liter V6 engines have been discarded, and because of the W-body nature of the car, adding a six-speed to the existing engines would not have been feasible. Besides that, there are no other updates scheduled for the 2012 model year.